Want to bring some nature lore into your novel? Before you do that, it would be a good idea to know whether the wisdom you’re about to include is true or just a myth. So, this week, a handful of oft-repeated bits of nature lore – some true, some not. And, because these are barely the tip of the iceberg, I’ve included some links at the end to help you navigate between myth and scientific reality when it comes to nature lore. 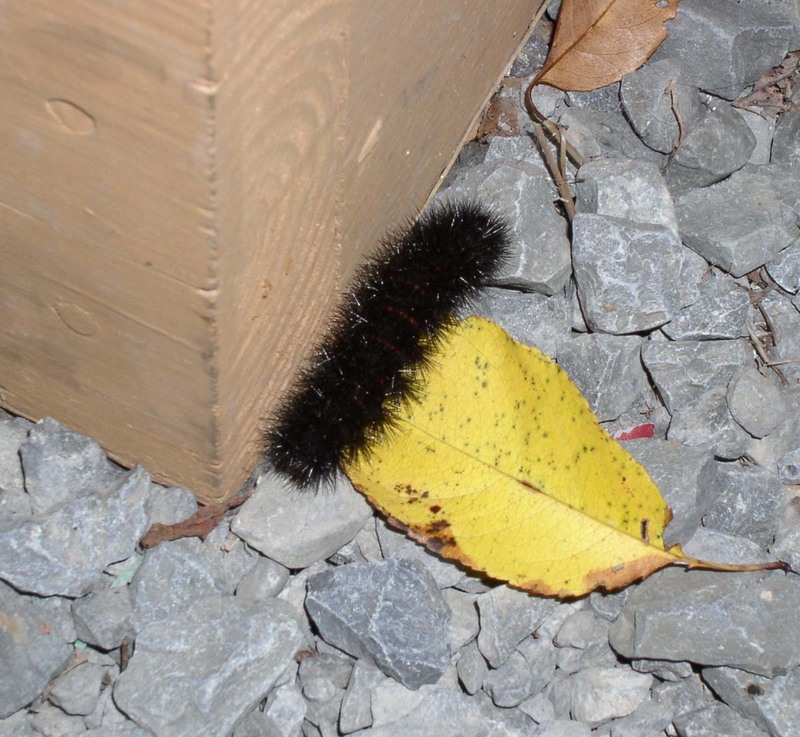 Banded Woolly Bears (or Woolly Worms) are the fuzzy orange and black caterpillars of the Isabella tiger moth, Pyrrharctia Isabella. 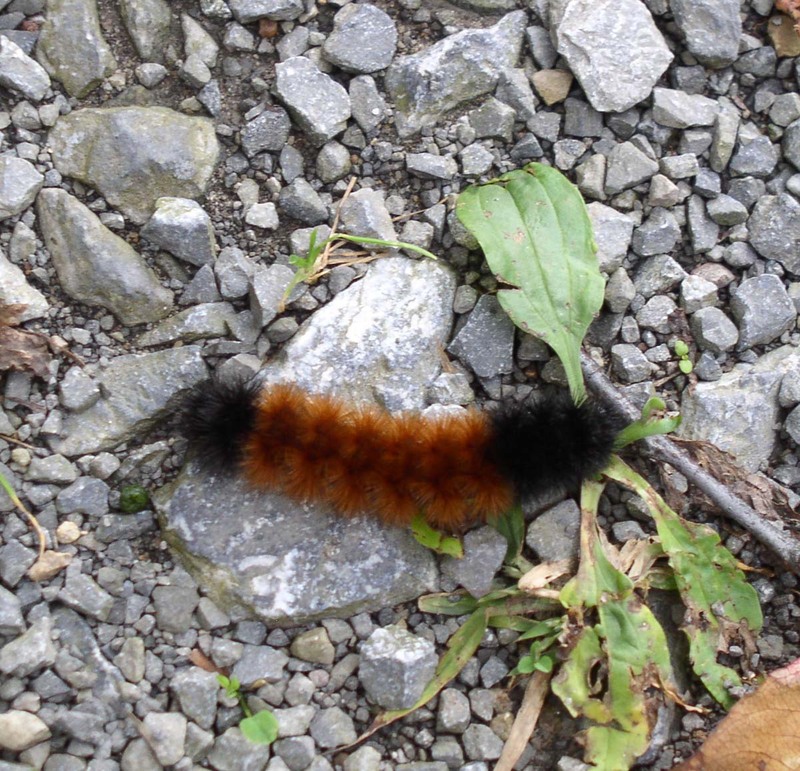 In the fall these furry creatures go on the march, looking for sheltered places to overwinter. Lore has it that the amount of orange on the caterpillar can be used to predict the upcoming winter – the less orange, the harsher the winter will be. 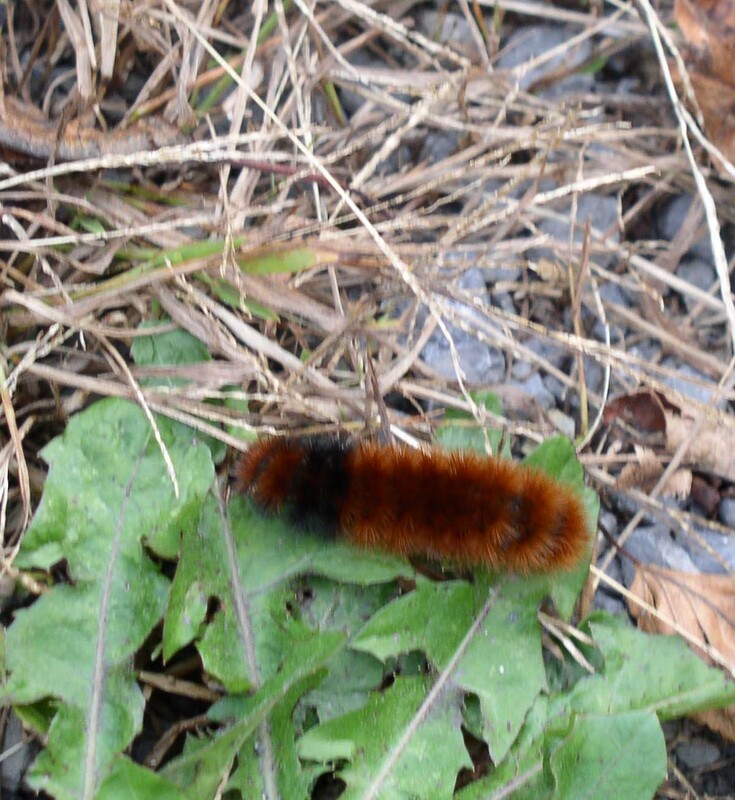 Unsurprisingly, the color ratio of the woolly bear has no relation to the future winter. Instead, the amount of black varies with the age of the caterpillar and how wet it was where the caterpillar developed. Here is the thing about animals (or anything else in nature) predicting the weather – they can’t. There is no way for an animal or a plant to “foresee” what the future season is going to bring. Any response – thicker coat, more insulated nests, more hoarding of food—are all based on current or past conditions. That’s not to say they can’t sense an impending storm or other near-future weather event. Many animals and plants are sensitive to changes in barometric pressure, temperature, and/or humidity. Some animals can also smell distant water or hear far off thunder better than we can. While this makes them seem prescient, in reality, they are sensing current conditions. Supposedly you can tell the temperature outdoors by counting how often a cricket chirps in a given period of time. Male crickets use their legs to generate chirps (females do not chirp) so presumably, the colder the crickets are, the slower they move. Number of chirps in 14 seconds + 40 = Temperature in Fahrenheit. …was even better. So her results were almost spot-on with The Old Farmer’s Almanac version. This past summer Accuweather’s Adrienne Veilleux tested the Farmer’s Almanac formula using crickets she purchased at a pet store. It looks like you’ll have to test your own crickets to see which formula works best. Take my quills, O Hiawatha! I’m afraid Longfellow didn’t know much about Hedgehogs. No it is not possible for a porcupine or a hedgehog to launch its quills at you any more than it’s possible for you to launch your hair at someone. Sure, the quills will fall out or can be pulled out, especially if they are imbedded in your dog, but they cannot be shot out in projectile fashion. When a porcupine or hedgehog is threatened it raises its quills, much the way a cat raises its fur to look larger. If the creature bothering the porcupine doesn’t take a hint (in the way of most house dogs) the porcupine turns its back and lashes out with its tail. Perhaps people saw that behavior and though the animal was throwing its quills. Yes, I just wanted an excuse to post that video. Maybe you just want to skip all this nature lore and and add cute porcupine “puppy” to your novel. See the smooth section in the middle called the “clitellum”? You’ll notice all of the important bits are in front of that. The clitellum is important as well. It is art of the reproductive system of the earthworm. 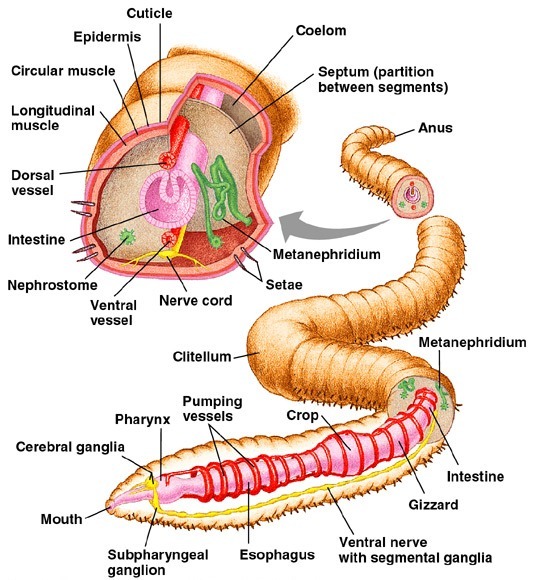 For the front half of the worm to survive, it must include the clitellum and at least 10 segments behind the clitellum. But don’t do this, ok? It’s not really nice to cut up earthworms. And, because I didn’t have time to find one more example, I’ll let you do that. Ask me a nature-related “is it real or myth?” question today (Friday only), and I’ll do my best to answer you in comments. NextWant to engage kids in science? Then DO science. Have you ever seen videos of Teddy the talking porcupine? He doesn’t actually “talk”, but he sure does make human-sounding noises. As for myths, what about this one: If you’re lost in a forest, can you tell which direction is north by observing what side of a tree moss/lichen grows upon? I did see that video! Very cute too. Sadly, the moss on the north side of the tree thing is a MYTH. The assumption behind the lore is that moss grows better in the shade and the north side of the tree gets the least amount of sunlight. However, the truth is, moss can grow on any side of a a tree. First off forests are bathed in shade so there is no particularly dark side. Secondly, different mosses have different sun/shade tolerances. Some do just fine on the sunny side of life.